BOYARKA, Ukraine -- Since Ukraine's conflict with Russia erupted, Oleksandr Federenko has gone from village kid to army cadet, trading computer games for knife-throwing classes and morning marches. He is only 13. 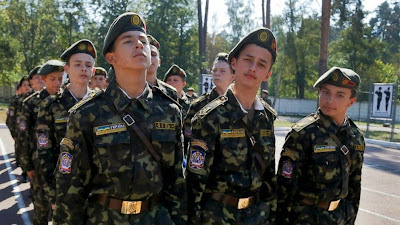 Oleksandr Federenko, second right, and students march during military training exercise in a military school in Boyarka, close to Kiev, Ukraine. Federenko is one of many Ukrainians who doesn’t trust Russia or the Russian-backed separatist rebels in eastern Ukraine enough to believe that a shaky cease-fire called last month will hold. In four years’ time, he’ll be ready to fight. The government’s campaign against the rebels in the east has stoked a sharp rise in militarized patriotism in the rest of the country. Army ads dominate many TV stations, war heroes are at the top of every party’s candidate lists for this month’s parliamentary election and defense issues - once a second-echelon issue topic in Ukraine - are now at the top of the agenda. Federenko's shy laugh and wisp of upper lip hair seem at odds with his bulky camouflage uniform as he explains his decision to sign up for the military academy. "This year I had this feeling of patriotism," he says, "and I wanted to defend my country." In Ukraine, the government's campaign against pro-Russian rebellion in the east has united people of all ages in a newfound patriotic fervor. Army ads dominate TV stations, war heroes are at the top of every party's list for this month's parliamentary election and defense issues — once an afterthought in Ukraine — now lead the agenda. Although many Ukrainians are ready to give a cease-fire called last month a chance, they see it only as a temporary fix and are digging in for years of confrontation, if not outright war, with Russia. President Petro Poroshenko has struggled to sell his deal with Russia and the separatists to a skeptical home audience. "Solving the war in (the eastern regions of) Luhansk and Donetsk with the military alone is impossible," he said in a recent interview with Ukrainian television channels. "The more military groups we have there, the more the Russian army will send." Although Poroshenko says the "most dangerous part of the war" in the east has passed, fatal clashes continue, particularly at the government-held airport near the rebel stronghold of Donetsk, where more than 20 people have been killed this week. "Ukrainians are in theory in favor of restoring peace," said Andriy Bychenko, the director of sociological services at Kiev's Razumkov Center. "But the majority is not sure that this peace will be stable and dependable. They lack confidence in Russia." For Federenko and the other young cadets at the Boyarka military academy about 20 kilometers (12 miles) outside Kiev, that lack of confidence means adjusting to life in a Ukraine that sees itself as under constant threat. 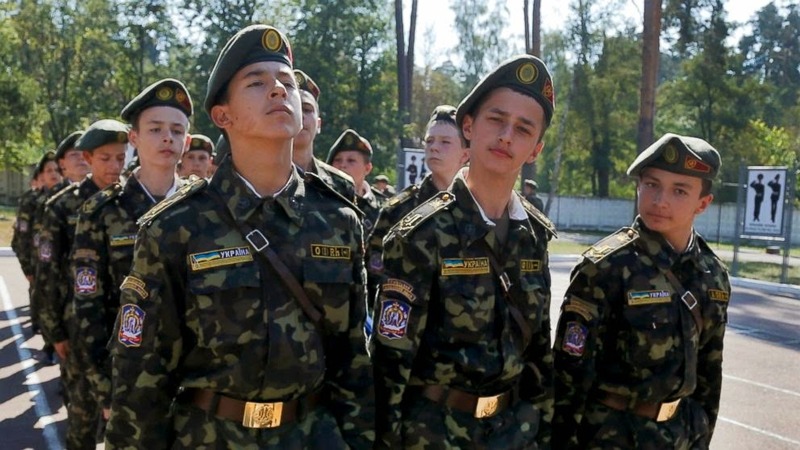 Federenko may come across as an unlikely fighter, but he and his friends are part of what Ukraine's Ministry of Defense says is a 13.7 percent increase in applications to military-run high schools this year alone. The military will receive an extra $3 billion, or 50 percent of previous budget targets, by 2017. The young cadet says he has struggled to adapt to the daily routine, and doesn't love the 6:30 wake-up time, the morning drills and the stingy one hour of free time a day. But here, he says, "you start to grow up quicker." Ukraine, too, has had to come to terms with some tough realities this year, and its deepening resentment of Russia is on full display in downtown Kiev. Stands selling smartphone cases decorated with Ukrainian embroidery patterns are also stocked with another top-selling item: toilet paper rolls showing Russian President Vladimir Putin and the inscription "PTN PNKh," an abbreviation for an obscene message to the Russian leader. As Ukraine rolls into election season, candidates have struggled to outdo each other with promises to continue the campaign against the rebels or bring Ukraine into NATO. Political parties have rushed to snap up war heroes. Nadiya Savchenko, a female pilot who was captured by Russian forces, tops the list of candidates for Fatherland, the party of gold-braided former prime minister Yulia Tymoshenko. Savchenko has been charged with the deaths of two Russian journalists and remains behind bars in Russia, so it's hard to see how she would be able join parliament. But her role as a figurehead says much about just how seriously Ukraine's politicians are taking public opinion about the conflict in the east. In a poll conducted the week after the cease-fire by the International Foundation for Electoral Systems, more than 50 percent of those polled in western and northern regions of Ukraine said that they supported ongoing military activities against the rebels. A total of 63 percent of respondents in the west and 54 percent in the north said they believed that Kiev had used "not enough force" against the separatists. The poll of 1,613 people had a margin of error of plus or minus 2.5 percentage points. Political parties have also added to their rosters leaders of volunteer militia groups, many of whom have been openly critical of the government for not taking a harder line against the rebels and for sending Ukrainian soldiers or volunteers into battle unprepared and ill-equipped. One political party that owes much of its success to rise of armed Ukrainian patriotism is the Radical Party, a previously marginal group with only one member of parliament that is now slated to garner at least 10 percent of the vote in the upcoming elections. Serhei Melnichuk, the leader of a pro-Ukraine militia that operates near Luhansk, is number three on the party list. The cease-fire "is a chance to re-arm so that later we can really hit them in the teeth and recapture our territory," he said by phone from the Luhansk region. "I am for peace, but I am prepared to fight."